R6160 seiries deisel engine is a new generation of 6160series which is developed by Weifang diesel engine factory in 2003 to meet the requirement of market. This product integrates the intemationally-advanced engine design conception with the 50-year-long engine manufacturing experience of Weichai, boasting wide power range, low consumption and excellent emission targets. Optimizing and improving the fuel system, intake and exhaust system, cooling system, lubrication system on the basis of original 6160 series. Adopting such advanced device as wet oil pan, eletrical pre-supply fuel pump, electric starting motor and sea-fresh water heat exchanger. While iheriting strongpoint of the original 6160, the performance is improved and the fuel cosumption is lowered ( no more than 205g/kw.h). The operation is simplified: there's no need to pump oil manually while atarting the engine. This 6160 series diesel engine, designed out of brand new conception, has reached internationally advanced position. Note: The marine engine is divided into left and right engine, making it convenient to operate in the same engine room. While facint the flywheel, the flywheel of the right rotates counterclockwise and the left engines rotates clockwise.The right engine is generally used when single engine is applied. 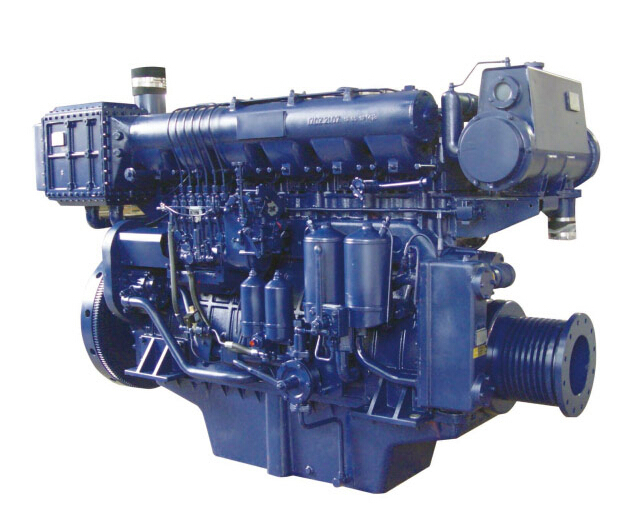 Looking for ideal WEICHAI Marine Engine Manufacturer & supplier ? We have a wide selection at great prices to help you get creative. All the Marine Diesel Generator Set are quality guaranteed. We are China Origin Factory of R6160 Series Engine. If you have any question, please feel free to contact us.